Employment is changing! Fewer of us have full-time jobs with final salary pensions, and the former assumption that if you studied hard you would get the job of your dreams no longer holds. Work It Out! will help you gain the skills, aptitude and confidence to adapt and prosper in this new world of work – whatever your age or background. Rather than devoting all your time to one job – often to the exclusion of other interests – Work It Out! shows you how to find and create individual pieces of work with the help of personal contacts, the internet and other resources, and use these workpieces to build a career. Work It Out! is about far more than the process of working to earn money. It provides a template for making work fit into your life, providing an income and financial security, but also accommodating the needs of your family and relationships, and satisfying your personal ambitions. Let it guide you in creating a life that is truly fulfilling! What others are saying about Work It Out! This book will change how we view work! Whatever your situation, everyone needs to read this book. This book gives a vision for a future where we work differently and it’s inspired. Highly recommended! There is no doubt about the ascendance of technology and the shift in how we live and work. Many of us are facing the reality of fewer available jobs. But in uncertain times, we still have choices - and this book helps us figure them out. With the phenomenal revolution in technology and communications, the working day has expanded to 24/7, social networking sites are all the rage and importantly, the marketplace is now global. Des McCabe puts forward the case for accompanying these changes, which require new ways of thinking, a new outlook, and new skills. Billed as a starting point and a guide, this book is brimful with practical ideas, techniques, and soul searching exercises. But be warned - go no further, if you're not prepared to ask yourself what you really want to achieve in life, or if you are determined not to follow your dreams! `Work It Out!' is a dynamic process that requires your leadership and personal responsibility. The units of exchange are "workpieces," or activities that you generate, and which will change over time. Moreover, anyone, regardless of background and ability, can engage in it. But listen up - you are invited to decide what you want to do, and to follow your passion, wherever possible. Happily, the book provides exercises to assist you with this - via thinking outside the box, and coming up with workable new ideas. Typically, a person might create a couple of income-generating workpieces, and one or two others that they also enjoy, but spend less time on. The key is to achieve a healthy balance, and a distinctive brand, while still "having a life". Three words came to mind when I got to about page ten of Des McCabe's Work It Out! 'fresh, exciting and real'. The author captures the feelings and frustrations of the modern job seeker with some excellent word pictures... "Moving from position 374 to position 178 in a league of 500 applicants is no comfort if there is only one vacancy".Before half way through I had to add 'serious, well researched and original' to my list of descriptions... "We are at a similar junction to the time of the industrial revolution - technology is once again re-writing the rules of work". Although I doubt there are many true Shamrock organisations 'a model for future corporate structures in which a core group of permanent professional employees, a cadre of part-time or contemporary workers and an army of freelancers, each form one leaf of the shamrock' out there, it is an inspiring model and like much of the books philosophy and guidance an ideal to aspire to. Where Work It Out! really challenges the status quo, both for employer and employee or Work It Out! worker is in its idea of 'a philosophy of mutual success' and describing a world where 'unlike many business models which are competitive, solitary and exclusive [Work It Out!] welcomes all colours". As I moved into 'Work It Out! and work pieces' and 'creating work pieces from nothing', my mind was flooded with ideas, with opportunities, with thoughts of things I could do and I was writing down and making 'practical' notes nearly every other page. With an overwhelming sense of optimism I moved into 'Work It Out! skills' keen and anticipating as I recognised my own thoughts fed back to me... "Why work for one person who you may not particularly like, when you could work for ten people who admire and respect you?" I didn't complete the work sheets as I want to keep this copy in good condition, I will be buying another 'working copy and having a go at designing my own Work It Out! work pieces. I thoroughly recommend this book for those who are stuck... in a JOB looking for a way out, or without a JOB looking for a way in and everyone who is wandering between and not sure how to make sense of the journey. Des McCabe has drawn THE map of the new world of work and it's a pretty useful one. 'Jobs for life' are indeed long gone. The last few decades have seen us rooted in no-man's land, rue-ing the loss of security, while unable to fully appreciate, and exploit, the true benefits of the brave new world of the 21st century. `Work It Out!' will propel you forcibly out of the wilderness. Keep your mind open and your outlook flexible and prepare to design yourself a life which aligns with your personal values, capitalises on your strengths and puts you in control, now and forever more. Sceptics take heed. I'd never heard of `Work It Out!' before I picked up the book, yet I am the very embodiment of a `Work It Out!' practitioner! My workpieces include (in no particular order): wife and mum of 2,educator, executive coach, parent governor, writer, entrepreneur, speaker, pro-bono mentor and erstwhile stand up comedian. I outsource, I barter my services and I've built a business from a virtual network. And just in case you're wondering, I've matched my corporate salary from my previous life! And the best thing about all of this? It has been created by me, to my own design, and will forever evolve to meet my needs and aspirations. If `Work It Out!' had been around when I started out 6 years ago, I would have got there quicker. But either way, I'm convinced that `Work It Out!' is the way forward - in some shape or form, for us all. With `Work It Out! 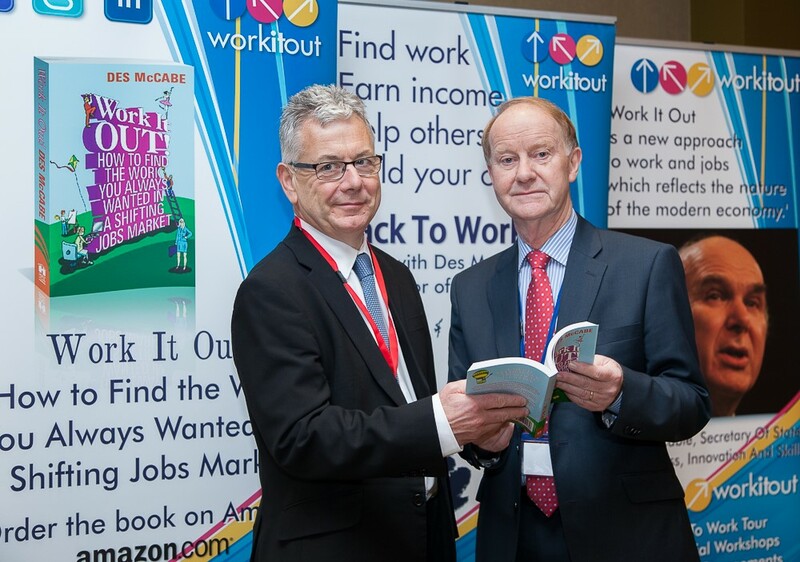 ', Des McCabe presents an extremely pragmatic approach to addressing the current unemployment and jobs crisis. Reinventing a new world in which a holistic vision of our future desired path is encouraged as opposed to the traditional 'Rear View Mirror' approach which inevitably results in more of the same. `Work It Out!' encourages empowerment and taking back responsibility for our careers and our future back from employers where it should have properly resided, with ourselves!! Anyone who has been made redundant will readily identify. A brilliantly simple solution for our times. Although I am a full time carer I do have some time on my hands and am keen to do some paid work. Having read this book I now realise that there were many areas of job hunting I was not considering. `Work It Out!' has really opened my eyes to many more options and given me the inspiration to examine these options in detail. I would recommend this book to all full time carers especially but generally with the lapse of the one big job for life...we all need to be more creative finding work!.